“We are delighted to have the opportunity to host Lt. Gov. Hochul on Daemen’s campus and to showcase the exceptional learning and recreational spaces available in our new world-class facility,” said Daemen President Gary A. Olson. 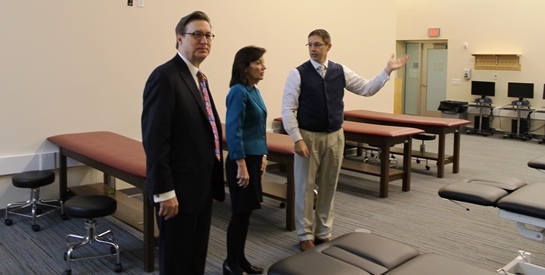 Hochul received an inside look at the Academic and Wellness Center’s high-tech classrooms and multimedia learning tools used to enhance the educational experience for students in Daemen’s physical therapy, athletic training and health care studies programs. Opened in the fall, the $5.6 million completely refurbished building, which is located across the street from the college’s main campus, also includes a modern fitness center and renovated gymnasium.